From 1976 to 1983, the South American country of Argentina was governed by a military dictatorship under the title of the National Reorganization Process. Other than name-dropping Juan and Eva Peron from Evita, this history is a blind spot to North American audiences. LESSON #1: LEARN THE “DIRTY WAR” ERA OF ARGENTINA-- The divisive junta control had people on edge amid declining economic conditions and escalating poverty rates. In what became known as the “Dirty War,” citizens by the thousands who spoke out in opposition and sought a return to democracy became the unfortunate victims of forced and unsolved disappearances. Looming dread of unchecked threats was palpable in every citizen. The Long Night of Francisco Sanctis displays an astute microcosm experience of such disquiet and paranoia. Based on the novel of the same name by Humberto Constantini, this film adaptation from directors Francisco Marquez and Andrea Testa was a Un Certain Regard contender at the 2016 Cannes Film Festival and plays this week at the Gene Siskel Film Center. The titular Francisco Sanctis (Diego Velazquez of Kryptonite) at the center of this single 1977 day in Bueno Aires is a mustachioed father of two children with his wife Angelica (Viola’s Laura Paredes). He’s a diligent office worker often noticed for his “sacrifice, efficiency, and order.” His overseers offer faint praise in the form of baited rewards rather than a real promotion. All the while, the composed Francisco keeps his head down and forward and his nose clean. A challenging and dirtying element for that nose comes in the form of the unannounced arrival of an old college friend named Elena (Valeria Lois from History of Fear). She is a connected woman in the underground anti-military movement and remembers a time twenty years ago when Francisco was equally vigilant in his writing before his mature domestication as a family man. Elena comes to Francisco with an urgent plea for help. She has him memorize an address and two names of people targeted by the Dirty War regime for removal. LESSON #2: ACTION VERSUS INACTION-- Rocked with shock, yet thrust with responsibility, Francisco wrestles with the circumstances at hand. He can help and save two innocent lives, or he can do nothing and likely spare his own. Where do his principles lie and what choice will he make? This is the conflict or crux of this singular story. Over the course of a dark evening in The Long Night of Francisco Sanctis, cigarettes are smoked, bolts are tightened, and stresses grow. Marquez and Testa’s film maintains a taut pace bathed in a raw and evocative urban landscape brimming with unsettling atmosphere. Streetlights shine perception and the nocturnal shadows beyond their reach hide unseen risks. Every dog bark and each click of the cement sidewalks under the tenuous steps of period-era shoes fuel bated breaths and shiver fearful anticipation of the unknown. Velazquez weathers his pendulum of trepidation and culpability with an empathetic appeal to represent the formerly silent citizens of this Argentinian era. 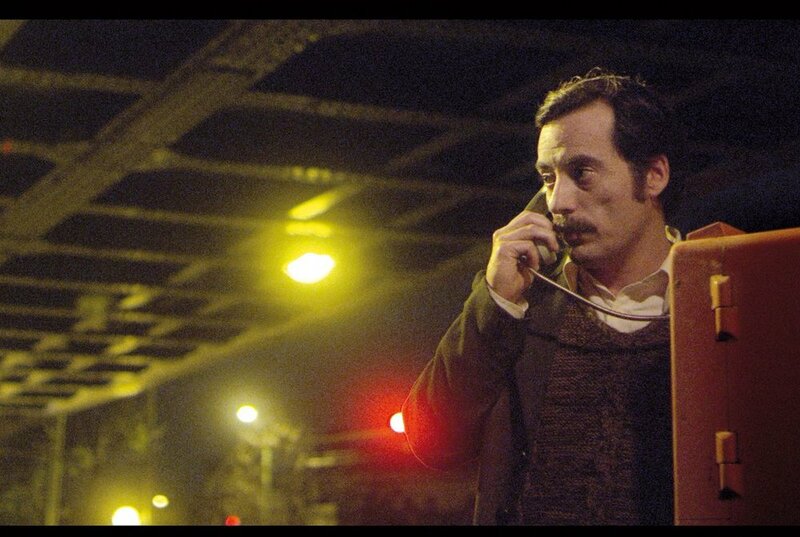 In a terse 80 minutes, The Long Night of Francisco Sanctis locks its suspenseful build and holds your attention. Open-ended as it is, the film could have employed additional time to hammer its points home and offer a payoff. However, it’s minimal surface and suddenness feels intentional to mirror the mysterious fates that befell so many people of this era. Quietly powerful, the effect and feeling are convincing. LESSON #3: SMALL ACTION IS STILL ACTION-- Any effort is better than no effort at all. Cognizance is better than ignorance. When one would say “it’s the least I could do,” the challenge should be to do more than the minimum. Call that effort morality.